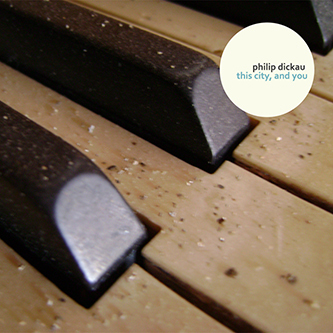 Philip Dickau is a Canadian musician making experimental and ambient electronic music with computer software. This City, and You his first official release under his real name. In his own words: "The tracks on this album are all results of about a year-and-a-half of experimenting with the limits of Propellerheads' Reason 4.0 software. My goal with these pieces was to make electronic music that was atmospheric and affective, and to explore the possibilities of as wide a range of sound creation techniques as possible. Sonically, the album explores the idea of sounds being processed and distorted until the line between organic and electronic becomes blurred. This process of degrading the natural harmonics of sound is reflected in the album's cover art; a decaying piano covered with debris. The album's narrative traces a non-linear account of the past two years of my life, culminating in the (obviously fictionalized) destruction of the city of Edmonton in a world-wide apocalyptic event." This album will soon be released as a CD-R with artwork and photography. Watch my myspace page for details. Sounds Like: dense clouds of music; glitches and damaged instruments; a melange of acoustic and synthetic sounds. RIYL: Christian Fennesz, Mark Templeton, Tim Hecker, Stars of the Lid, Belong, or anything from the Kranky, Touch, Type, Anticipate, or 12K record labels.